Next entry: Rock and roll cricketers? Carlin Romano, who teaches philosophy and media theory at the University of Pennsylvania, writes about honorary degrees, in The Chronicle Review. He begings his piece by arguing that honorary degrees do nothing for universities. He quotes Jacques Barzun, who says: “the honorary degree as now commonly dealt out has lost its point”, and: “The Chairman of the Board of General Aphrodisiacs may be all that is said of him in the citation, but it is not a judgment on which the university should set its seal.” Universities should stick to rewarding measurable academic excellence. MIT and Harvard eke out their existences without awarding any such degrees. Others should follow their example, says Romano. But then he gets to the matter of Robert Mugabe. Yet for all this history and perspective, indicating that honorary degrees and their nullifications amount to tempests in teapots, the peculiar biography of Robert Mugabe makes the matter more complicated. Recent journalistic attention to Zimbabwe’s tragedies, welcome as it is, has provided little context about the man causing them. For that, we’re fortunate to have three incisive books on him published in the last decade: Our Votes, Our Guns: Robert Mugabe and the Tragedy of Zimbabwe, by Martin Meredith (Public Affairs, 2002); Degrees in Violence: Robert Mugabe and the Struggle for Power in Zimbabwe, by David Blair (Continuum, 2002); and Robert Mugabe: A Life of Power and Violence, by Stephen Chan (University of Michigan Press, 2003). All paint a portrait of Mugabe that may surprise non-Africa hands ignorant of his prepresidential life. Born in the Jesuit mission station of Kutama on February 21, 1924, the third of six children in a family abandoned by his father (a dyspeptic carpenter who moved 300 miles away and took another wife), young Mugabe could not have been more bookish as he rose to become a teacher. “All accounts describe him in the same words,” writes Blair, “diligent, quiet, studious, introverted.” Mugabe shunned smoking and drinking alcohol and “excelled academically” at every institution he attended, including South Africa’s University of Fort Hare, the hotbed of African nationalism from which Nelson Mandela had been expelled earlier. 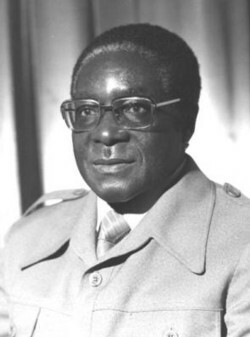 During Mugabe’s 11 years of imprisonment, from 1963 to 1974, under Zimbabwe’s white-ruled predecessor state of Rhodesia, the future president enrolled in University of London correspondence courses and earned four degrees — a master’s degree in economics, a bachelor’s degree in administration, and two law degrees — to go with the three bachelor’s degrees he already possessed, in economics, education, and history and literature. Meredith writes of how Mugabe in prison “resumed his studies with fierce dedication, his books piled on both sides of his bed.” The prisoner’s late wife, Sally Hayfron, then living in London, copied out whole volumes by hand and posted them as letters to her husband. When Mugabe finally won release from prison, in November 1974, he held seven academic degrees. So even now, after more than three decades in which the former Marxist revolutionary leader — seen as conciliatory toward opponents at Zimbabwe’s independence — has evolved into a murderous autocrat, Mugabe’s lust for academic credibility may endure. In the paranoid recesses of Mugabe’s octogenarian brain, stripping him of degrees may exact a toll few can imagine. In which case, it’s probably time for Michigan State University, which doled out an honorary doctorate to Mugabe in 1990, to step up. And what about those seven earned degrees? Can a university revoke degrees earned in a correspondence course? How? By sending Mugabe a letter? Why not leave him only the eighth academic laurel he famously boasts of — “a degree in violence”? Now, after Zimbabwe’s latest parody of democracy, the man once called “Satan’s apostle” by his also-ruthless white predecessor stands as the re-elected president of Zimbabwe. If things keep going as they’re going, however, Mugabe can forget about retiring to one of those handsomely endowed chairs at a Florida university, the sort that draw Oxford dons seeking to up their pay in a sunny place. He simply won’t have the credentials. A degree in education. How about that? The idea of stripping Mugabe of his various degrees, honorary and real, was causing much mockery on Mock The Week, when I watched the latest manifestation of it a few days ago, as did England refusing to play cricket against Zimbabwe next year. But it would appear that even if taking his degrees away won’t now do anything to stop Mugabe, this might cause him some small degree (so to speak) of hurt. More Mugabe honorary degree complaint here.